IOWA CITY (April 7) - The United States of America freestyle wrestling team, led by Olympic champions Kyle SNYDER and Jordan BURROUGHS, fed off the home crowd on the opening day of the Freestyle World Cup, picking up two convincing victories. USA opened the two-day competition with a 10-0 shutout over India in the Saturday morning session. The Americans outscored their opposition 54-3 in the dual meet and registered seven technical falls. In the afternoon session, USA faced a hungry Japan team fresh off beating Georgia 7-3. The dual meet opened with a rematch of last year's gold-medal match at 57kg between Yuki TAKAHASHI (JPN) and Thomas GILMAN (USA). Gilman scored first off a passivity in the opening period, but Takahashi scored two takedowns in the final 1:30 to take the victory, 4-1. Japan rode the momentum created by Takahashi to get victories at 61kg and 65kg by Kazuya KOYANAGI and Takuto OTOGURO respectively to grab a 3-0 lead. Otoguro's victory came over 2016 world champion Logan STIEBER, 10-5. James GREEN, a two-time world medalist, stopped the bleeding for the Americans as he held on to defeat Kirin KINOSHITA 8-5. Green led 6-0 early in the match, but Kinoshita battled back to keep it competitive. But it was all USA the rest of the way. Burroughs (74kg), Kyle DAKE (79kg), David TAYLOR (86kg), J'den COX (92kg), Snyder (97kg) and Nick GWIAZDOWSKI (125 kg) claimed victories to give USA a 7-3 victory over Japan. Burroughs, a four-time world champion and 2012 Olympic champion, improved his Freestyle World Cup record to 25-0 with his two victories on Saturday. "I've wrestled in a lot of World Cups, but I've never been a part of a team that's won it," Burroughs said. "I really want to win this thing. Our team is competing at a high level. It’s our time. I don’t think there is anybody in the world that can compete with what we’ve got going on right now." USA is looking to capture its 14th Freestyle World Cup title, but first since 2003. In Pool B, Azerbaijan finished 2-0 on the opening day of the Freestyle Cup. In arguably the most anticipated dual meet of the morning session, Azerbaijan dominated Cuba, winning eight of 10 matches. Azerbaijan opened with victories at 57kg and 61kg. Alejandro VALDES TOBIER (CUB) picked up perhaps the most impressive win of the day, earning a fall over three-time world champ Haji ALIYEV (AZE) at 65kg. The Cuban had built an 8-2 lead prior to the fall. After Valdes Tobier's victory, Azerbaijan claimed victories in six of the final seven matches to win the dual meet 8-2. Azerbaijan followed up its victory over Cuba with a 9-1 win over Kazakhstan. Wrestling is scheduled to begin at 10 a.m. CT on Sunday. The bronze-medal match is slated for 2:15 p.m., while the gold-medal match is set for 4 p.m.
CORSIER-SUR-VEVEY (February 11) – United World Wrestling has announced the draw for the 2019 Freestyle World Cup Yakutia, Russia. The annual dual-meet event is a highlight of the international wrestling calendar and features the top eight teams from the 2018 World Championships in Budapest. 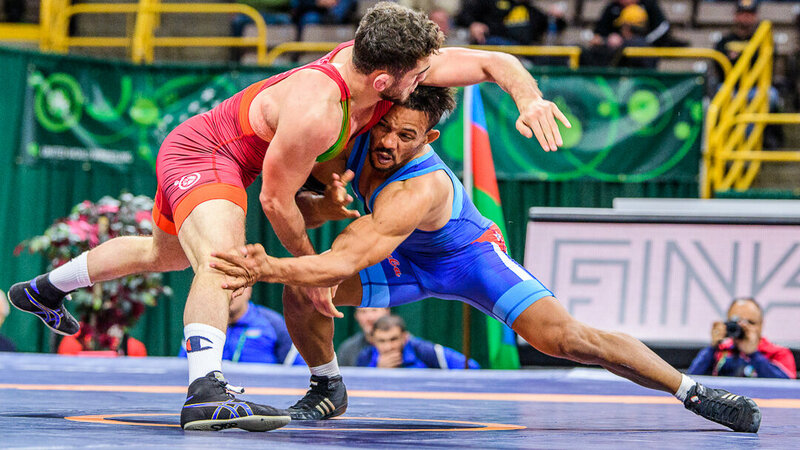 The UWW executive board determined this week that all World Cup competitions, including the Greco-Roman and Women’s World Cup, should follow the same competition format for placement of teams in their respective pools, or groups. With the new system, the No. 1 team will be paired with the No.4, No.5, and No.8teams from the world championships. The international wrestling calendar picks back up Feb. 23in Gyor, Hungary, with the Hungarian Grand Prix, the second stop in the Greco-Roman Ranking Series calendar.